← George in Washington, we love what you’re doing to help #FreeSavchenko! YAVORIV, Ukraine — Lt. Yevgen Zabrodsky stands for a portrait at the International Security and Peacekeeping Center here, 25 September 2014. 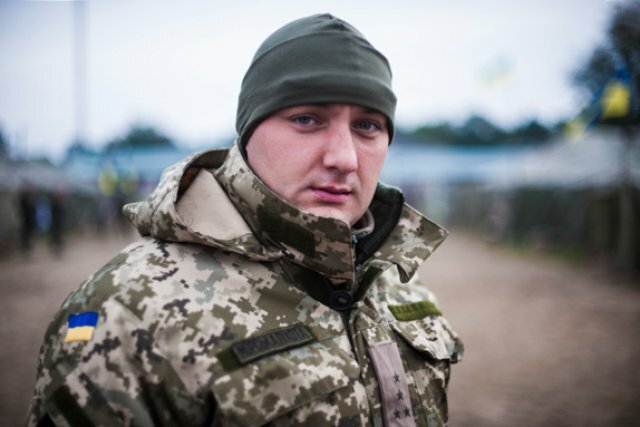 Zabrodsky, a Marine officer in the Ukraine military and native of Kharkiv, Ukraine, was stationed at the Ukrainian Naval Headquarters in Crimea when Russian forces invaded early this year. He and his unit were barricaded inside the headquarters installation for weeks more than a month before Ukraine withdrew military personnel from the peninsula. Crimea has since voted to separate from Ukraine and has been annexed by the Russian Federation in a move largely condemned by the international community. Author’s Note: I had the chance to interview Lt. Yevgen Zabrodsky in Ukraine at Rapid Trident 2014, a multinational training exercise in which 15 countries contributed more than 1,000 troops to the training in Ukraine for the first time since the conflict exploded on Ukraine’s eastern border. He told me that by and large, the Ukraine military thought they were allies with the West and on good working terms with Russia, given their long history. They never expected to face an adversary during their lifetime. By the time they realized what the Russian military was up to, the invasion was underway, and the territory all but lost. The main reason he wanted to share his story with me was to get the facts from the situation on the ground out to a wide military audience, to be able to share lessons learned, and help prepare other militaries for similar actions from Russia or any other aggressor state. In his view, the Ukraine military was unprepared and caught off guard and if there is one take away from the outcome in Ukraine, it’s that you never know what can happen and a military should be prepared for anything. Ideally, more than one source would have been better for this story. With access only to one of the personnel from the Russian invasion of Crimea though, I thought telling the story through Lt. Zabrodsky’s eyes still makes for an important contribution to the history of events unfolding in Ukraine. I hope readers agree. After waiting for what seemed like hours, Yevgen Zabrodsky snapped into action, scaling the fence of the Ukrainian Naval Headquarters complex. Zabrodsky, a Lt. with the Ukrainian Marines, had been watching from inside the small installation as what he referred to as the “little green man,” a poorly disguised Russian soldier, patrolled part of the perimeter surrounding the small installation. This entry was posted in "Voices" in English, Crimea, English, English News, Eyewitness stories, Pictures and tagged #RussiaInvadedUkraine, #StopRussianAggression, #UkraineUnderAttack, Marines, Ukraine. Bookmark the permalink.